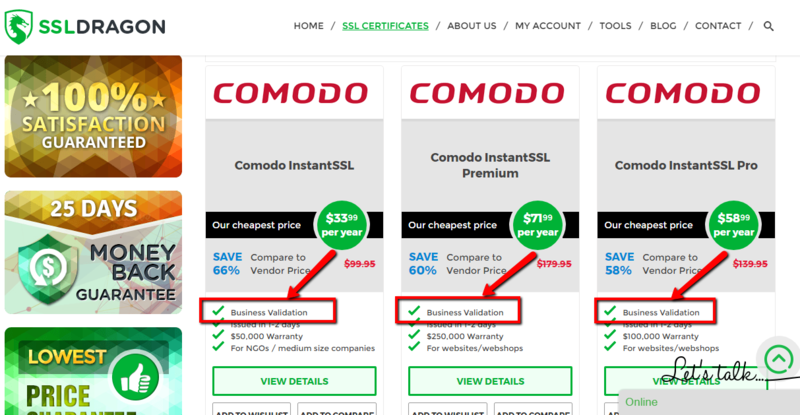 Comodo Platinum SSL is a great Business Validated (BV) certificate which comes with $1,000,000 warranty and standard 128/258 bit encryption. As a result of the business validation, the issuance time for this SSL Certificate is between 1 and 3 business days. Before issuing the certificate, the Certificate Authority (CA) will verify your business, the company owner, and will make sure that the company is officially registered with the right governmental authority, and that the business performs its activity at the provided location. It is important for you to make sure that the company’s contact information that you submit for the CSR matches the one in third party business directories, public telephone listings and in the publicly viewable WHOIS search. 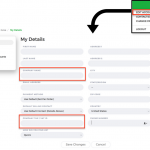 After the installation process is completed, your website will display the following trust indicators: the gray “http” will turn into a green “https”, and the green padlock icon will appear next to it. 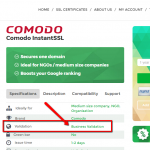 You will also get the static site seal from Comodo which will inform your website visitors that your business has been verified by a highly trusted company in the website security industry. Therefore, users will feel safe doing transactions on your website, knowing that their personal information, credit card information and user credentials are secured and in good hands. Like other Comodo (now Sectigo) SSLs, this certificate is compatible with most mobile and desktop browsers, it can be re-issued for free, and it can be installed on an unlimited number of servers. Our goal is your full satisfaction. That is why we have a 25 days money back guarantee policy. Also, you can replace your SSL Certificate with a different one within 25 days. All these benefits are intended to help you get the right website security solution for your business. Finally, we will offer you a 7% or 15% discount if you buy this SSL certificate for 2 or 3 years. Google will be more than happy to rank your secured website higher among its search results, following the “HTTPS everywhere” policy, which it came up with in 2014. The policy says that Google will give a priority to websites which have an SSL certificate. 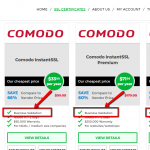 Comodo Platinum SSL is the right choice for medium e-commerce websites. With a whopping $1,000,000 warranty our e-store couldn’t pass up this product. The validation was uneventful. We received it on the second day.